Step out of the city life by going to Caldeira das Sete Cidades and Poca Da Dona Beija. Take a break from Ponta Delgada with a short trip to Parque Terra Nostra in Furnas, about 46 minutes away. There's lots more to do: explore the activities along Lagoa do Fogo, take in the architecture and atmosphere at Igreja Matriz de Sao Sebastiao, enjoy the sand and surf at Praia de Santa Barbara, and get up close to creatures of the deep with a dolphin and whale watching tour. For photos, more things to do, where to stay, and tourist information, go to the Ponta Delgada trip tool . Philadelphia, USA to Ponta Delgada is an approximately 11-hour flight. You can also do a combination of train and flight. Traveling from Philadelphia to Ponta Delgada, you'll lose 4 hours due to the time zone difference. When traveling from Philadelphia in May, plan for little chillier days and about the same nights in Ponta Delgada: temperatures range from 66°F by day to 58°F at night. Wrap up your sightseeing on the 3rd (Mon) early enough to travel to Porto. Get outdoors at Praia da Luz and Rio Douro. Porto Cathedral (Se Catedral) and Palacio da Bolsa are good opportunities to explore the local culture. There's much more to do: take in the views from Ponte de Dom Luis I, wander the streets of Rua Santa Catarina, explore the world behind art at Museu Serralves, and steep yourself in history at Sao Joao da Foz Fortress. Planning Porto trip won't be overwheling when you use's Insprock itinerary maker. Traveling by flight from Ponta Delgada to Porto takes 5.5 hours. The time zone difference when traveling from Ponta Delgada to Porto is 1 hour. In June, plan for daily highs up to 73°F, and evening lows to 57°F. Cap off your sightseeing on the 6th (Thu) early enough to travel to Lisbon. Get outdoors at Praia da Nazare and Portugal Bike. 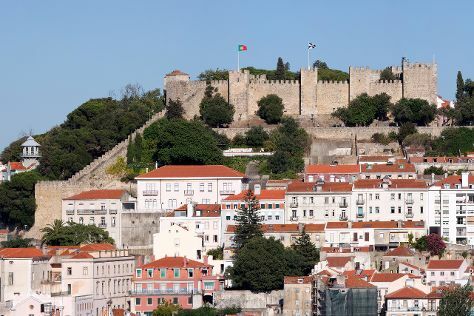 Do some cultural sightseeing at Castelo de S. Jorge and Belém Tower. Next up on the itinerary: take a stroll through Alfama, explore the world behind art at Museu Calouste Gulbenkian, tour the water at your own pace with Lisbon by Boat, and appreciate the history behind Arco do Triunfo. To find ratings, photos, traveler tips, and other tourist information, refer to the Lisbon tour planner . Traveling by flight from Porto to Lisbon takes 2.5 hours. Alternatively, you can take a train; or drive. Traveling from Porto in June, you will find days in Lisbon are somewhat warmer (81°F), and nights are about the same (60°F). Cap off your sightseeing on the 9th (Sun) early enough to travel back home.